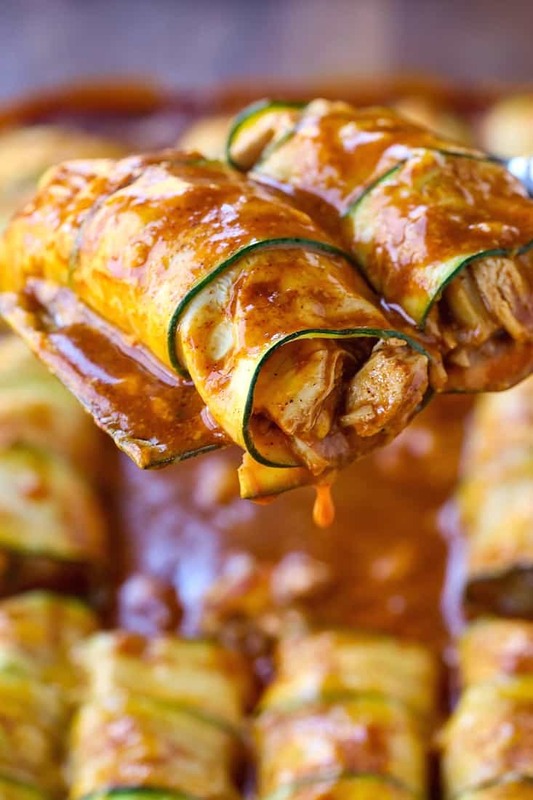 Try these Chicken Stuffed Zucchini Enchiladas for a low carb dinner tonight! Thin slices of zucchini replace the tortillas in this chicken enchilada recipe! We love super tasty low carb dinners like these enchiladas! Also try our Naked Sheet Pan Tacos on taco night, or this whole collection of Low Carb Meals! 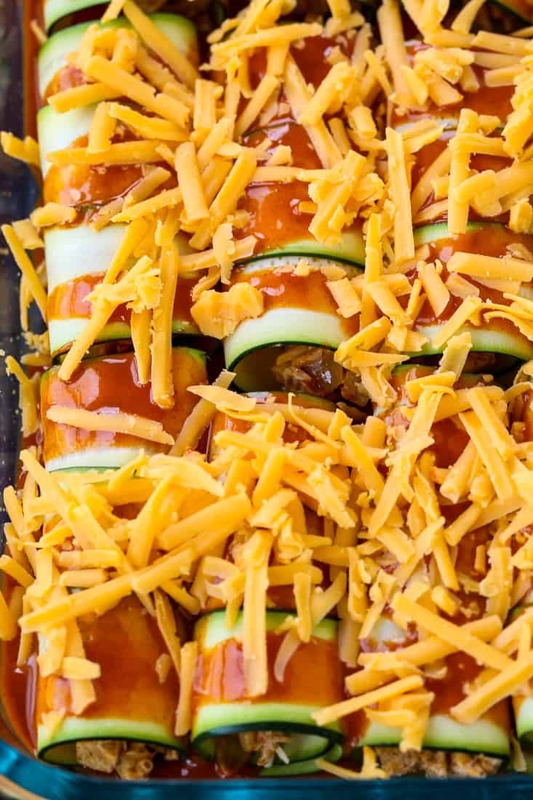 I have to be honest, whether you’re following a low carb diet plan or not, these Chicken Stuffed Zucchini Enchiladas are going to be a big hit. The chicken filling alone is worth making, we use any leftovers for lettuce wraps, in a salad or yeah – wrapped up in a tortilla. Because we’ve got kids who certainly aren’t following a low carb diet plan so making recipes like these low carb enchiladas makes everyone happy! Our favorite bottled enchilada sauce from Trader Joe’s is perfect in this recipe, but if you’d like to make your own feel free to do that! After testing out a few different store bought brands, as usual, TJ’s was our favorite. Grabbing a rotisserie chicken from the store makes this recipe doable even for a busy weeknight. But you’ve got options, too! Ground beef or pork would also be a perfect swap out in this enchilada recipe. Even ground chicken or turkey would be awesome, just brown it up with the onions and follow the recipe from there. 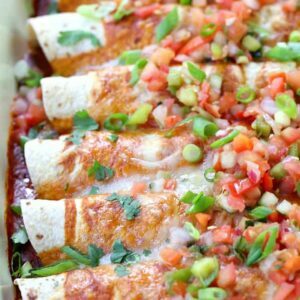 You could even make this enchilada recipe vegetarian by using beans or refried beans (or both) then maybe adding some diced peppers to bulk up the filling a little. So using beans in the filling sort of nixes the low carb part to this enchilada recipe but still a super delicious dinner. If you happen to be following Weight Watchers, beans are on the free points list so I can imagine these zucchini enchiladas would be pretty low in points value. 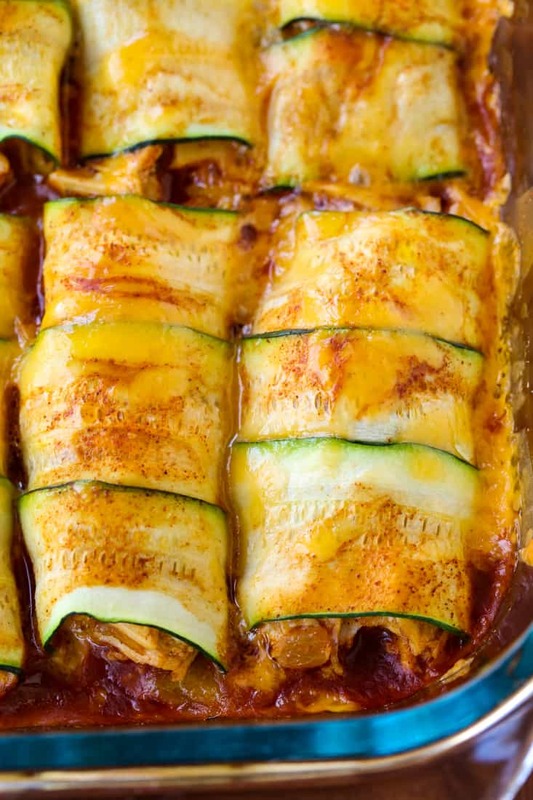 How Do You Make Zucchini Enchiladas? What you need to start with is the right tool. A mandoline slicer is the best tool for getting the zucchini sliced really thin, so it easily rolls up around the chicken filling. Slices that are too thick won’t easily roll up and will probably break up on you. Mandolines are pretty inexpensive, there’s a link to the one I use at the bottom of the post here. 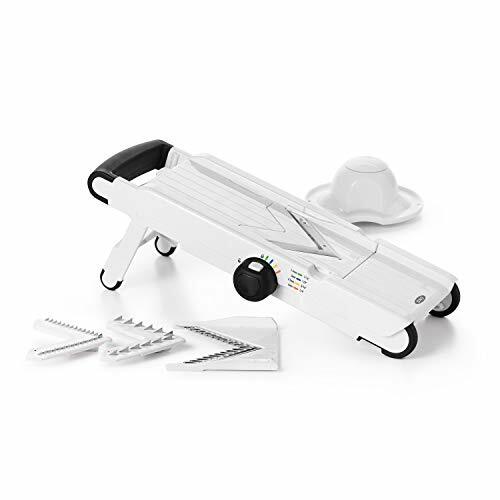 You can use a mandoline for lots of things like making homemade french fries or potato chips or any time you need a uniform, thin slice of something. Once you have the zucchini sliced, lay down three slices of zucchini so they overlap each other a little. Pile on a couple of tablespoons of the chicken filling and carefully roll up, ending up with the seam side on the bottom. 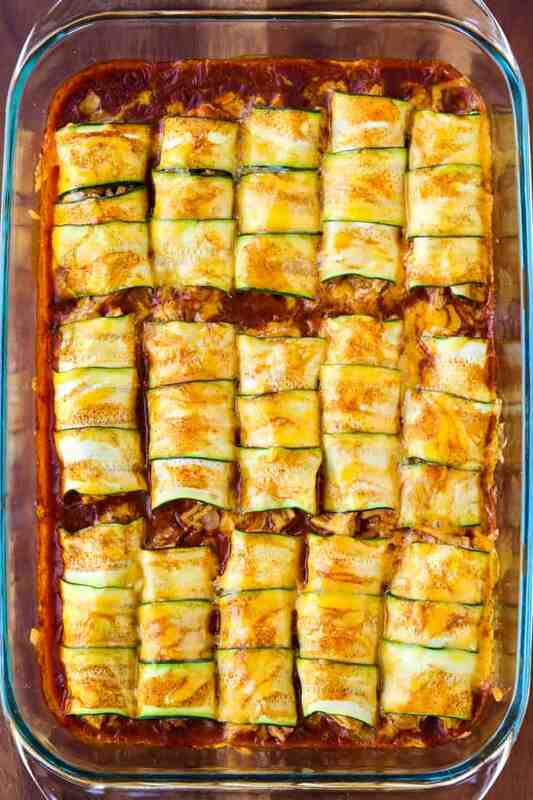 Pour some of the enchilada sauce to the bottom of a baking dish then start placing the zucchini enchiladas on top. I ended up with 3 rows with 5 enchiladas in each row. Now cover the tops of the enchiladas with the remaining sauce and then some cheese. I’ll leave the cheesiness up to you guys here, we used a little over a cup but you can go as cheesy as you like. Maybe switch up the cheese with monterey jack or pepper jack or a combination of all of them! These low carb enchiladas bake up really quickly too. Only 20 minutes in the oven and dinner is on the table! Now for your non-low carbers, you can serve these up with rice, even a delicious Mexican rice. Our boys like to crunch up some tortilla chip on top too – because they can. 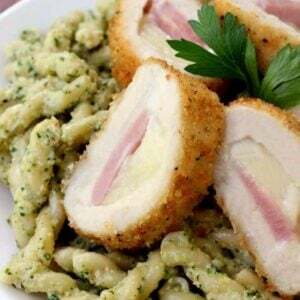 I have to admit, this was one of the low carb recipes that I didn’t think our boys were going to go crazy for. Man, was I wrong! They loved them even more than regular enchiladas – TRUTH. So don’t be afraid to try them! These low carb chicken enchiladas are going to be a hit with the whole family! 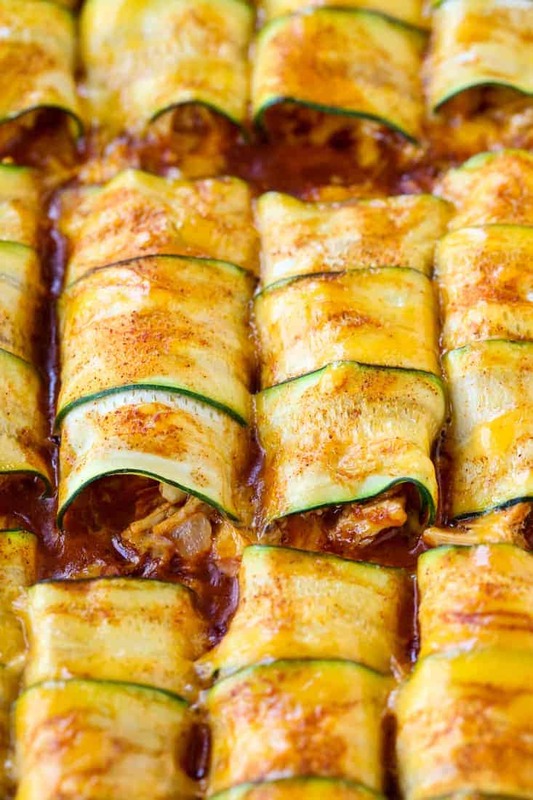 No tortillas in these enchiladas, just thin slices of zucchini! Add the oil to a large skillet, then add the onion and cook for 5-7 minutes until softened. Next add the garlic to the onions and cook for a minute longer. Add the chicken along with the salt, cumin, black pepper and chili powder. Stir to combine, then add the cream cheese, stirring into the chicken until it's melted. Pour 1/2 cup of the enchilada sauce into the chicken filling, stir then turn the heat off to cool slightly. 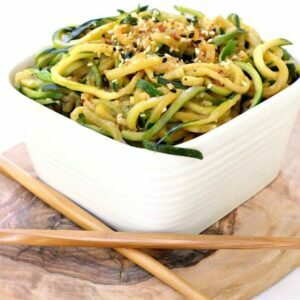 Slice the zucchini into very thin strips. The strips must be rollable, but not fall apart so you'll probably have to test a few slices out to get the right size. 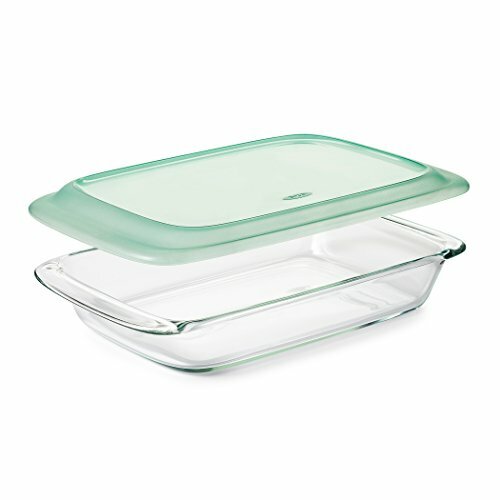 Add 1/2 cup of enchilada sauce to the bottom of a 9" x 13" baking dish, spreading to cover the bottom. Place 3 strips of zucchini on a board, overlapping slightly. Add about 3 tablespoons of the chicken filling across the zucchini strips. 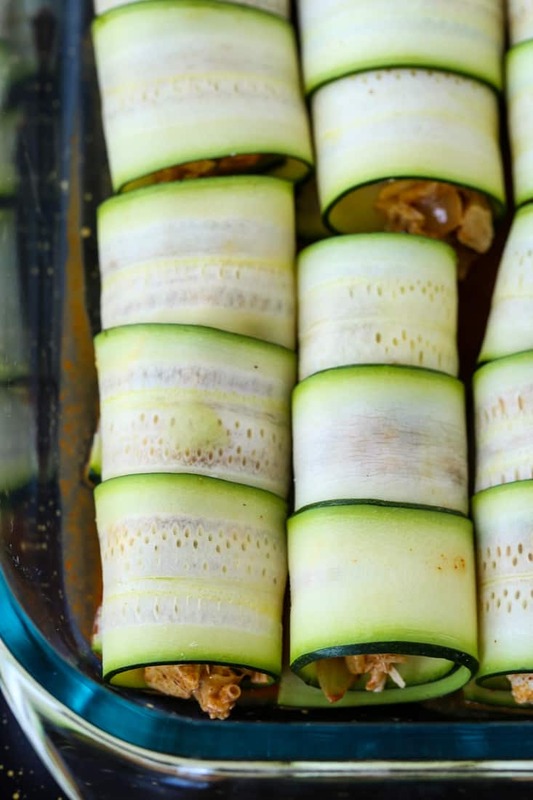 Roll the zucchini strips around the chicken filling, ending with the seam side down. Add to the prepared baking dish, then repeat until you have 15 enchiladas. Top the enchiladas with the remaining 1/2 cup of enchilada sauce, followed by the cheese. Bake for 20 minutes until the cheese on top is melted and the filling is armed through.